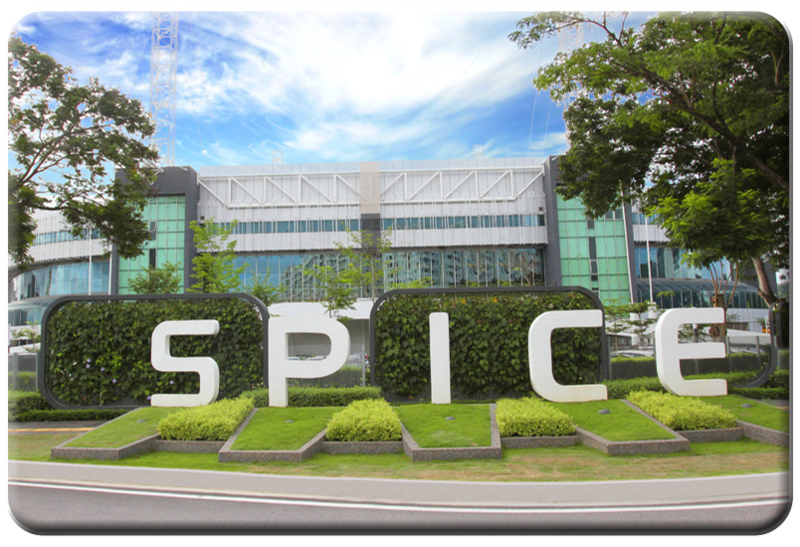 Before entering into SPICE, there are signboards for direction to Penang International Science Fair. 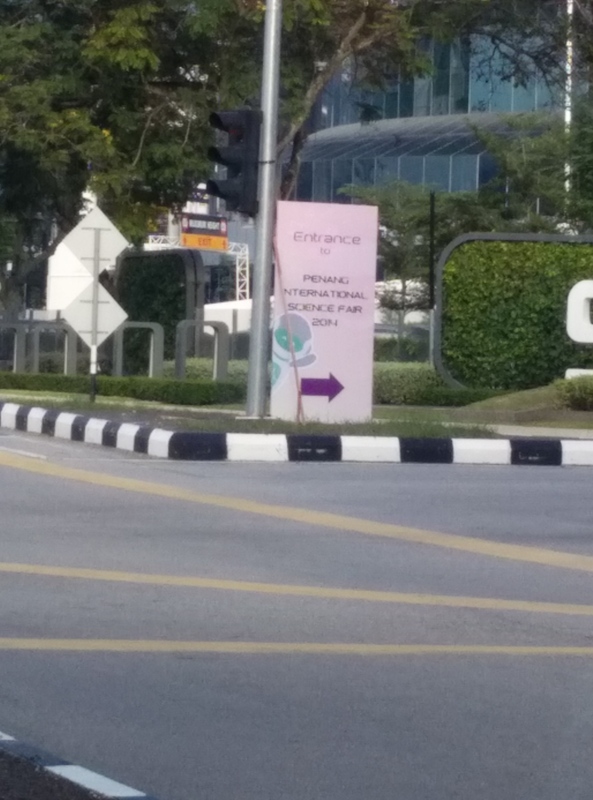 At the centre of arena, there is a showcase of Google Map Camera Car. 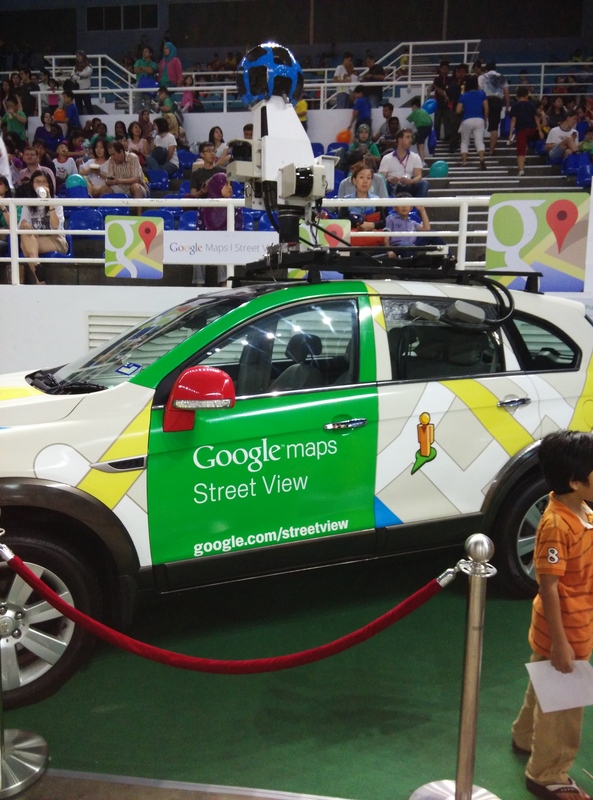 This is the car that is used to create the street view in Google Map. 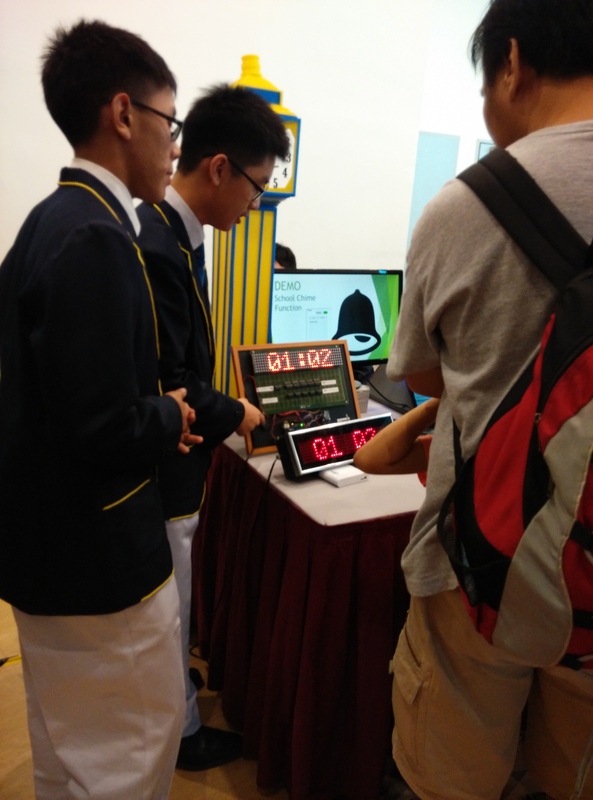 In the Penang International Science Fair, there are quite a number of booths, where secondary school students showing their project for Young Innovate Competition. 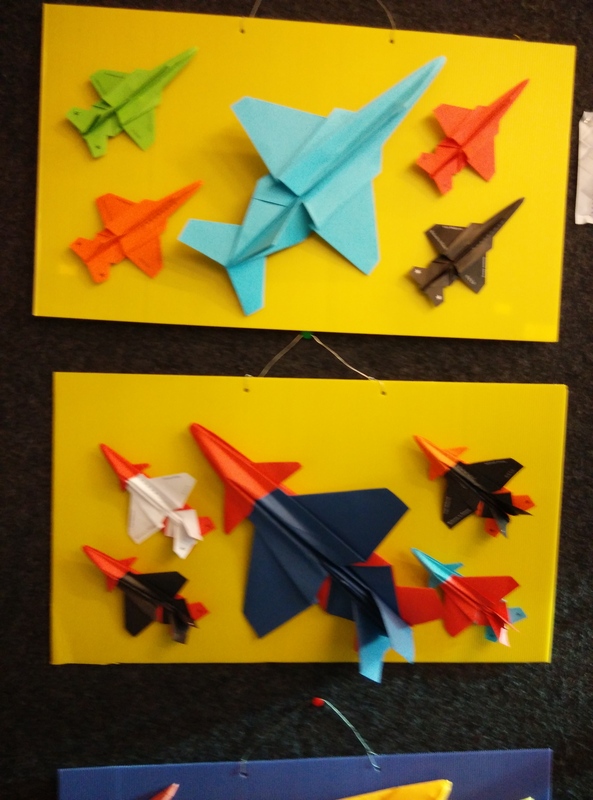 It is great to see that they are able to make creative projects at these young age. I have seen computers made from 7400 Series logic from the Internet. 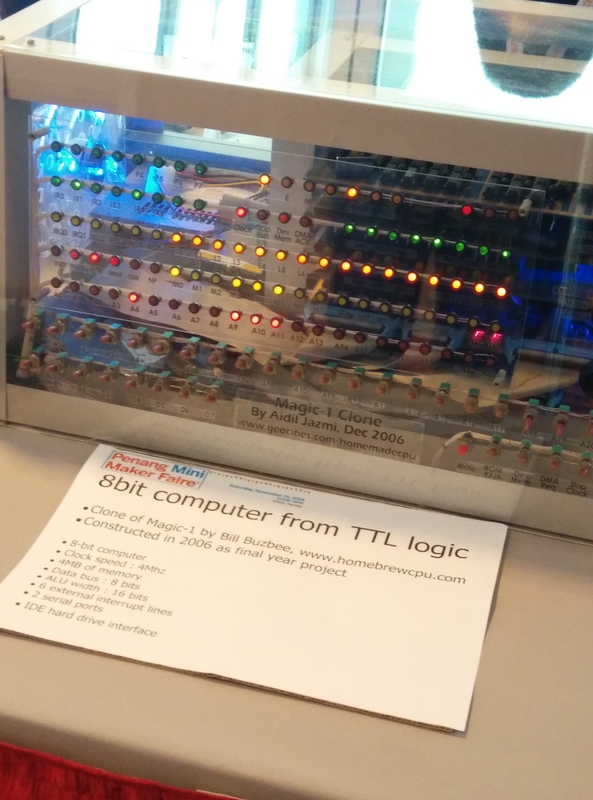 But this was my first time to see an actual 8 bit computer made from TTL logic. Isn’t it cool? 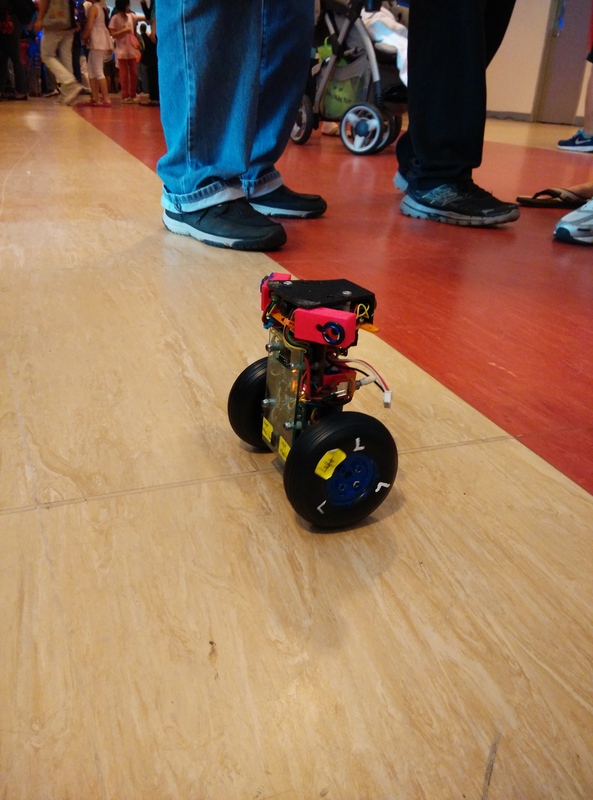 In the Mini Maker Faire, there is a booth displaying mini robots such as the one shown below, a two wheel balancing robot. The size of this robot is slightly larger than palm size. It is fascinating to see such a complex robot is able to made into this small. 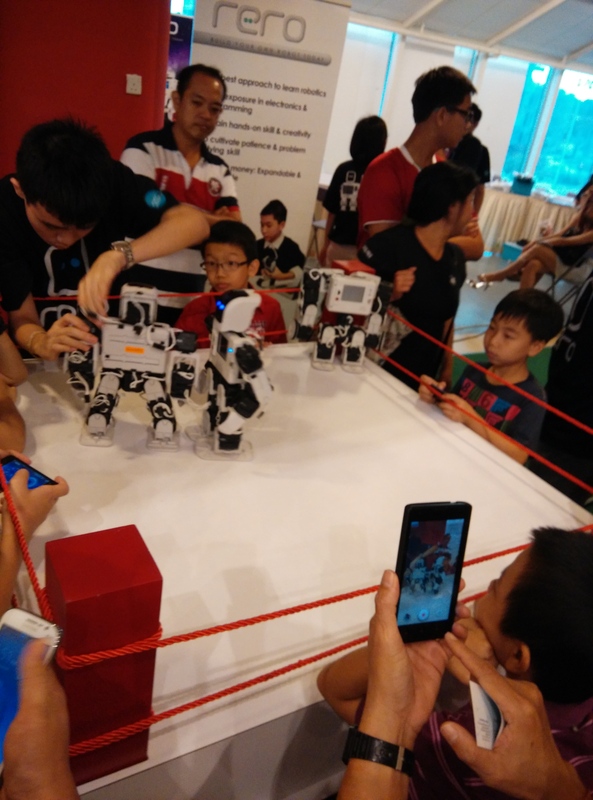 Intel also has their own booth in the Penang Mini Maker Faire. 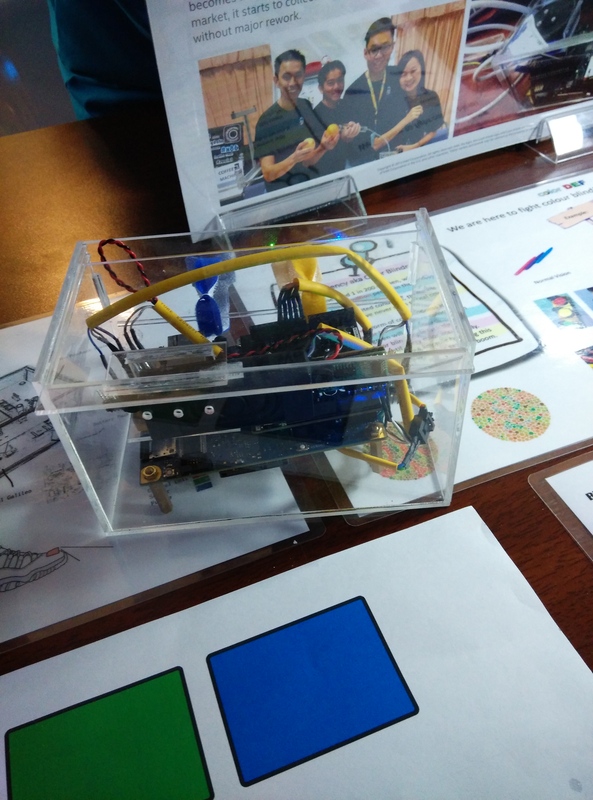 This booth focuses on the Internet of Things using Intel Edison. 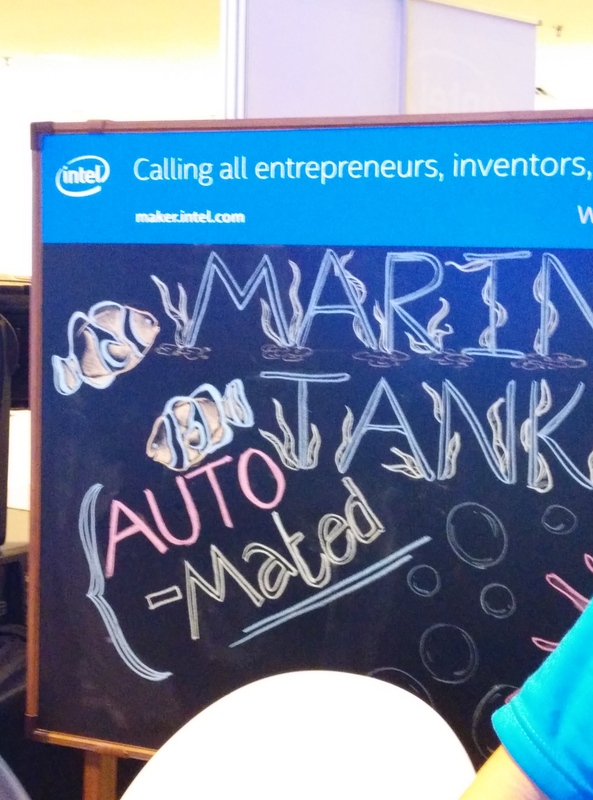 Some of the projects from Intel booth are home automation control, color detection and many more. 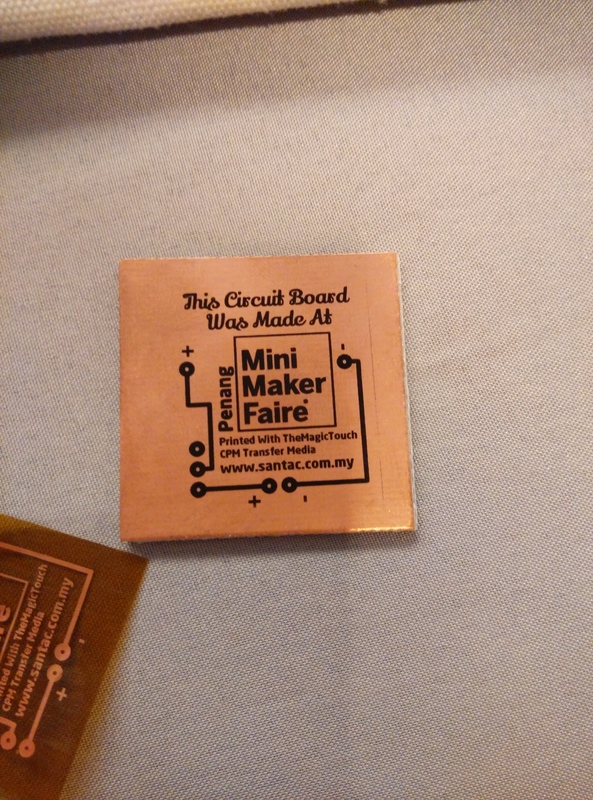 Santac has a booth in Penang Mini Maker Faire promoting the Toner Transfer method to create your own PCB. What is the technology used before transistor is invented? 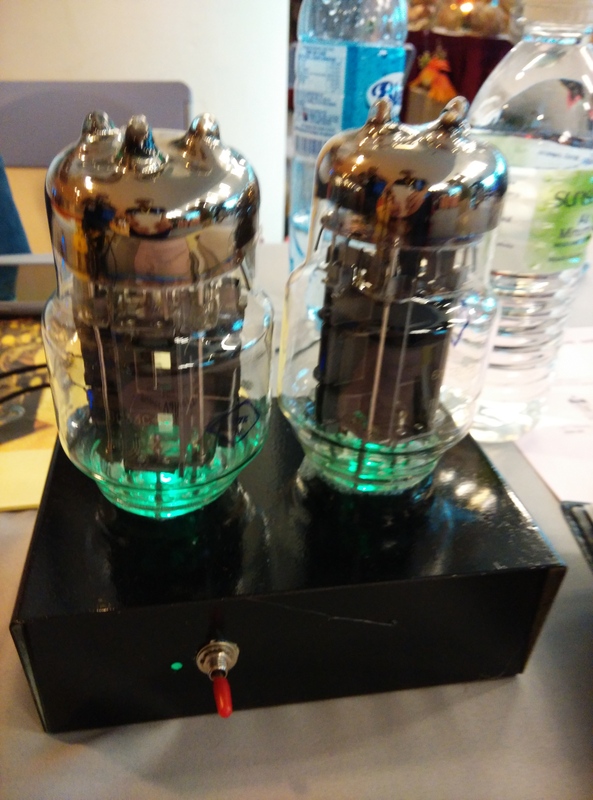 The answer is Vacuum tube. 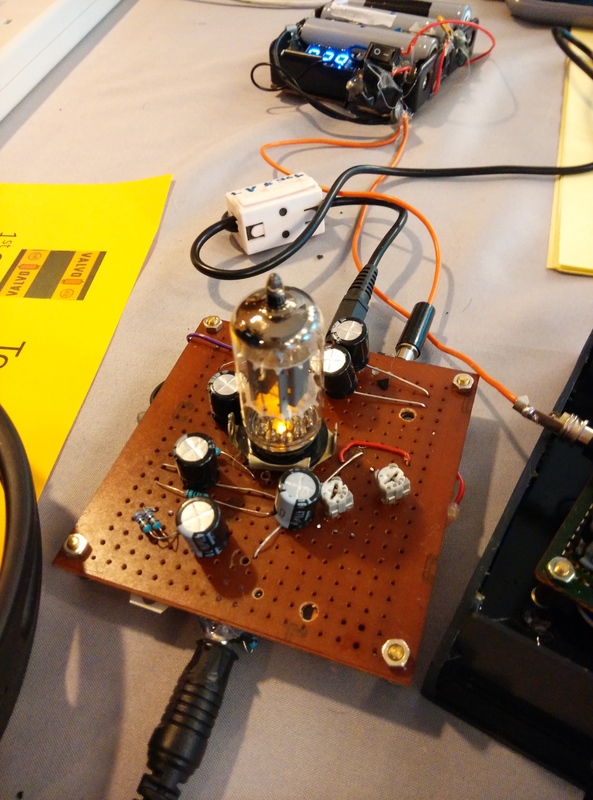 There is this maker booth displaying audio amplifier made from vacuum tube. 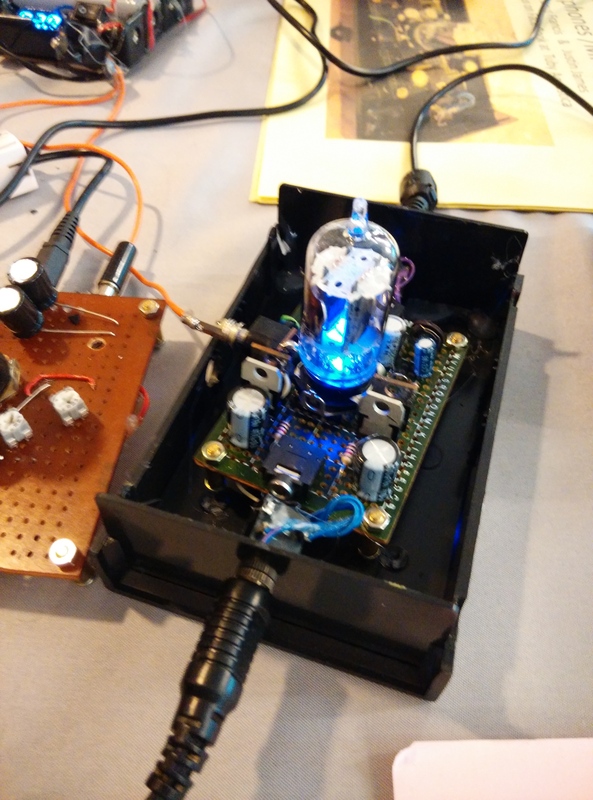 If you are looking for high quality audio amplifier, maybe you can have a try with vacuum tube audio amplifier. 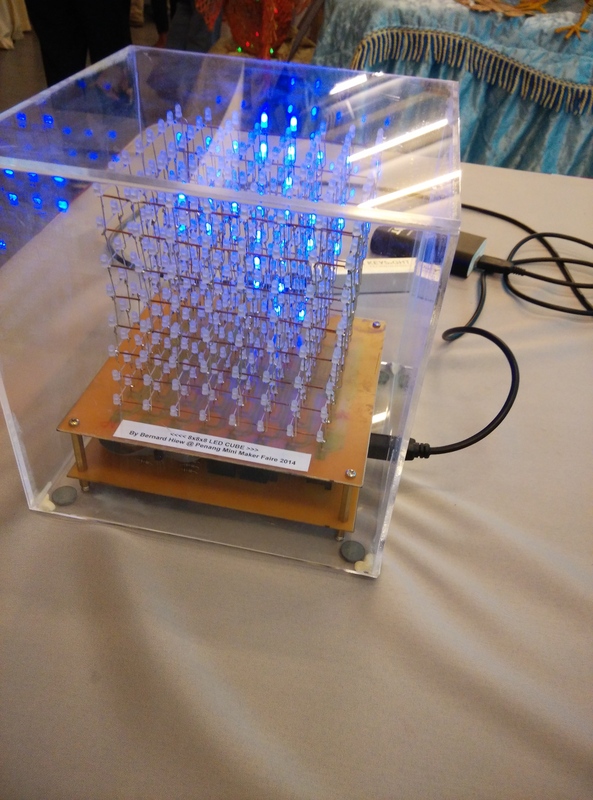 And then there is this booth showing LED cubes with the size 8x8x8 and 4x4x4. 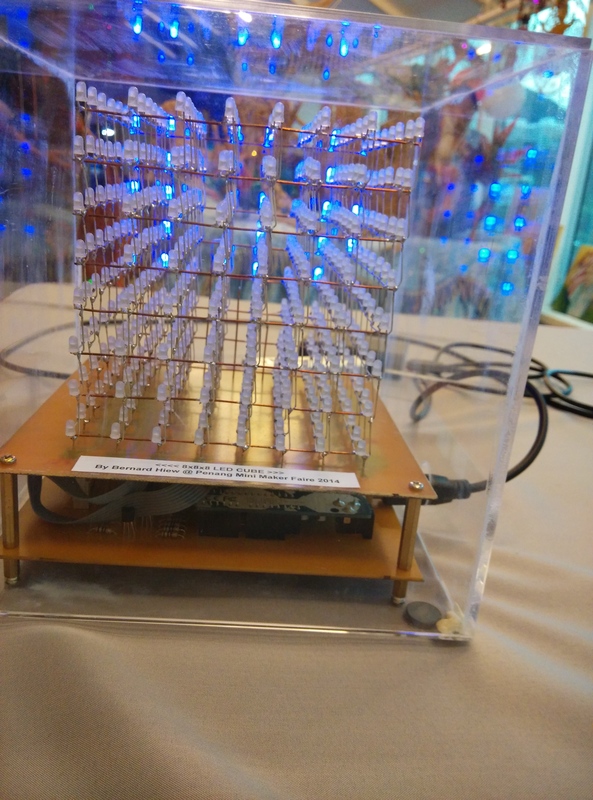 I think LED cubes are awesome that I could stare at it for whole day (probably). 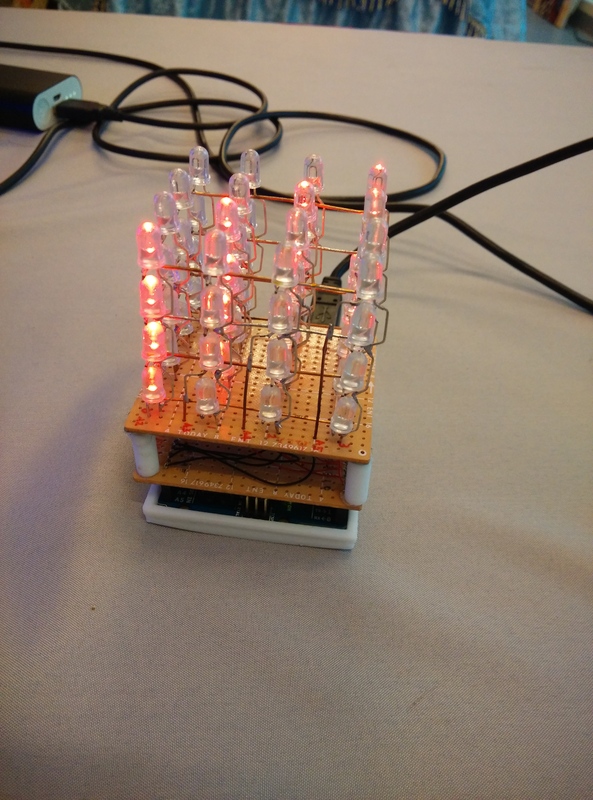 I would like to try making one LED cube if I have free time. 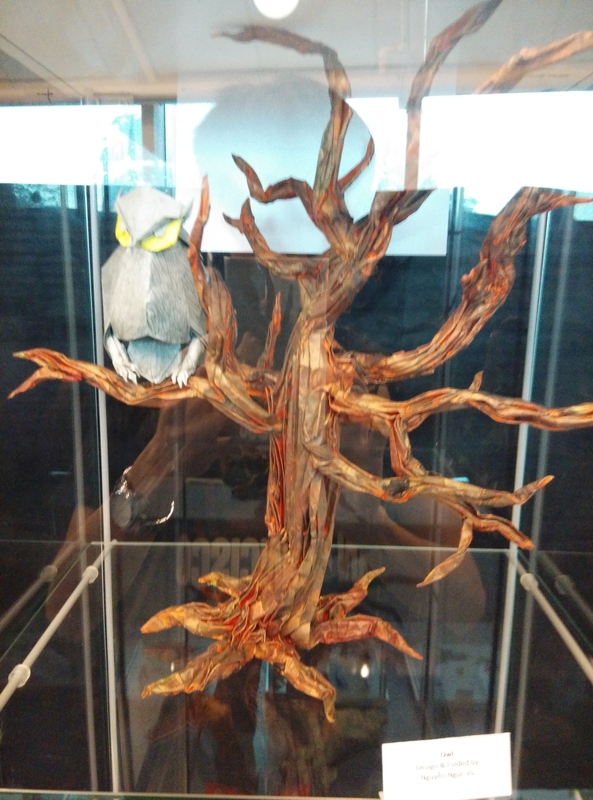 During PMMF, a maker from Japan, Sho Yoshida is here to promote the Shellmo Project. 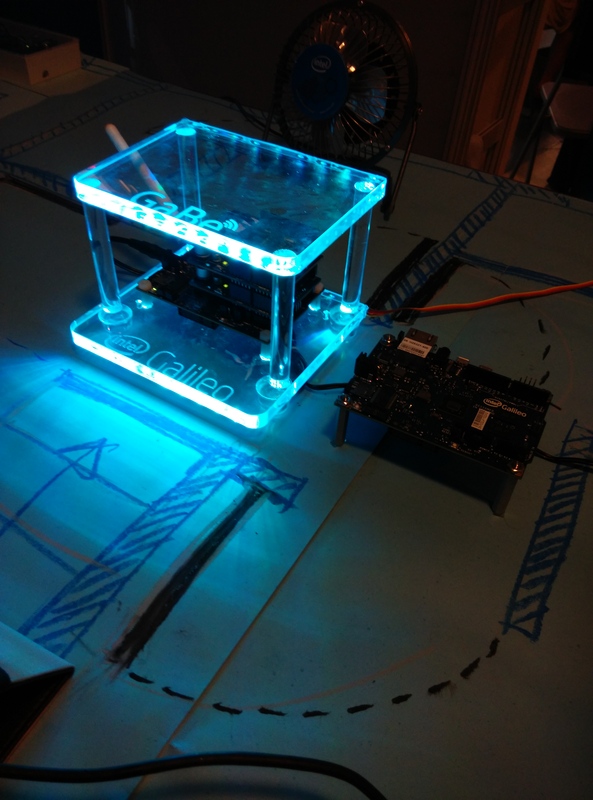 This project promotes more people into making robot by providing open source 3D printable body and much more. I didn’t managed to take photo of the robots but you can check them from the Gallery of Shellmo. 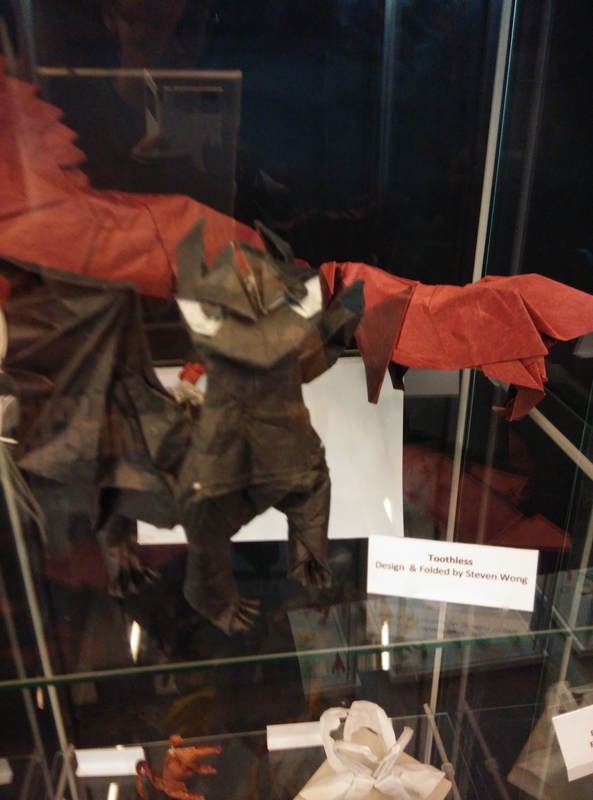 Origami, paper art is also part of the Penang Mini Maker Faire showcase. 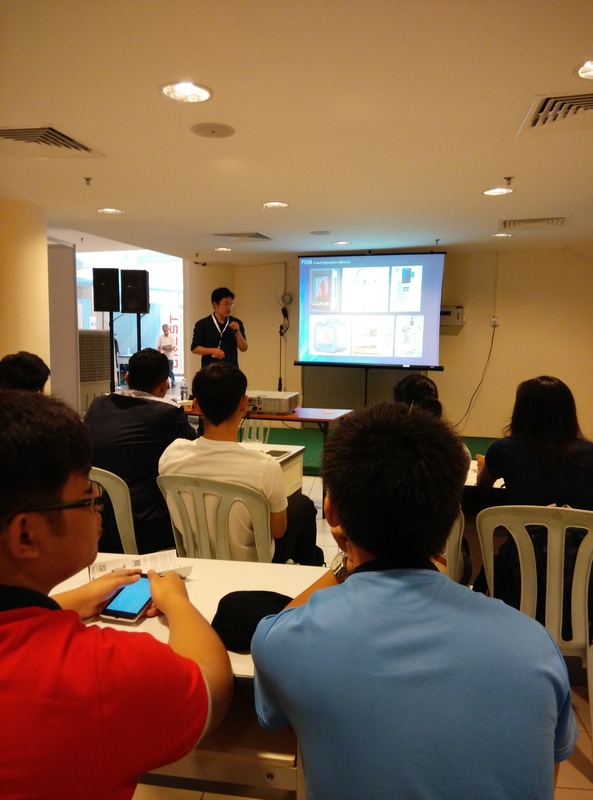 On the second day of PMMF, I registered myself on a 3D printing and design workshop by iMakerzone. 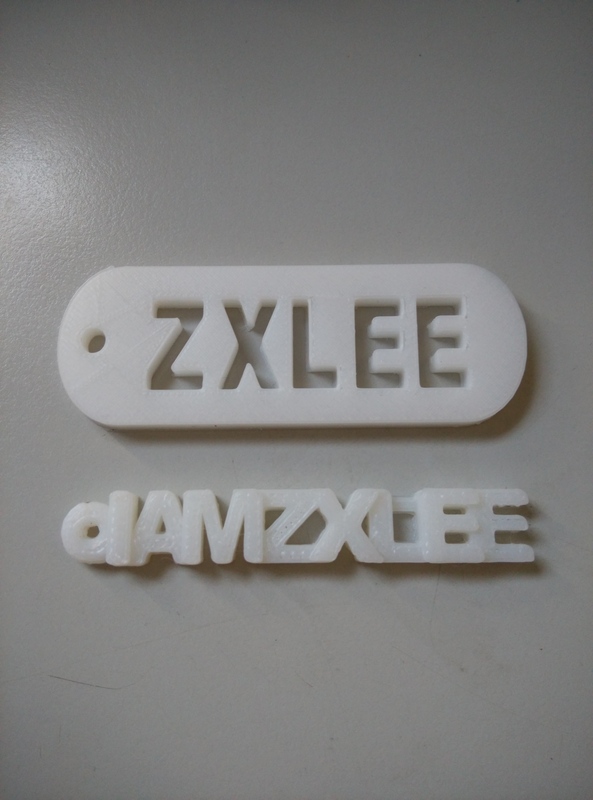 This was my first time to design a 3D printing object. 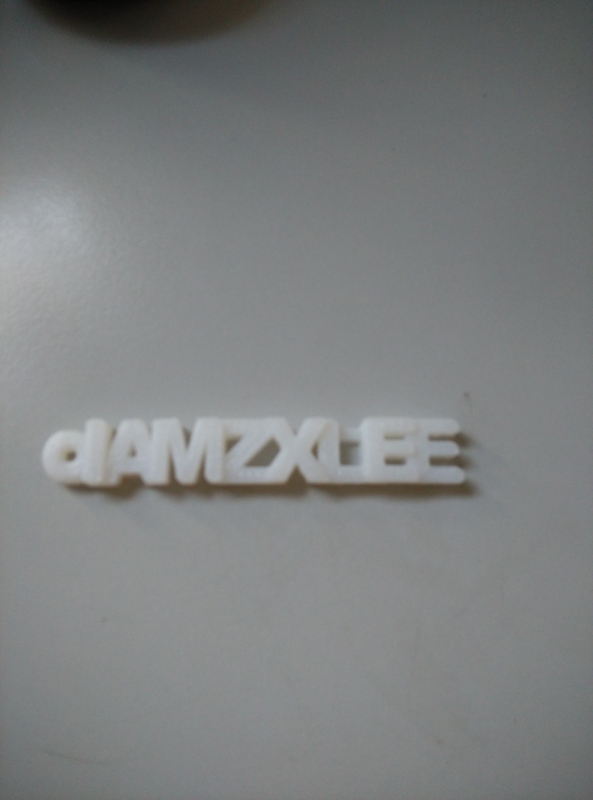 I learnt how to design using TinkerCAD. 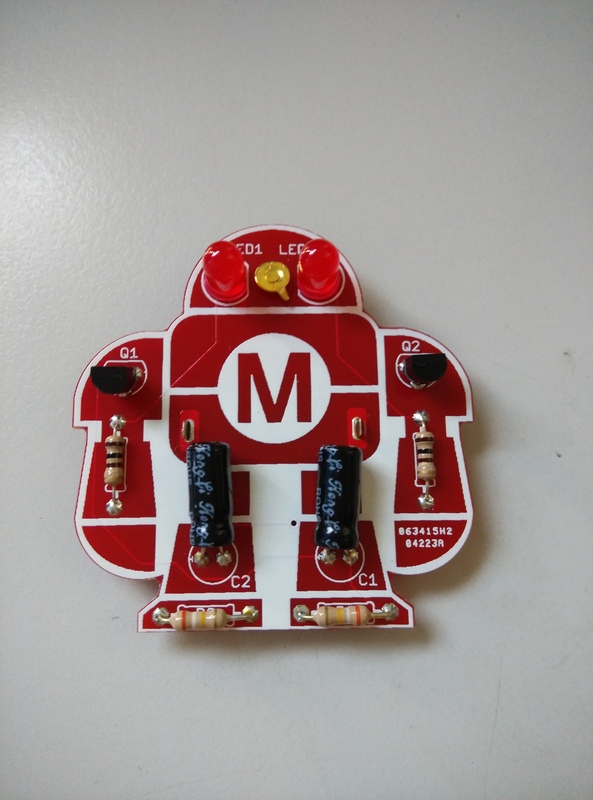 I also had a chance to hands on in soldering the Maker Faire Robot. 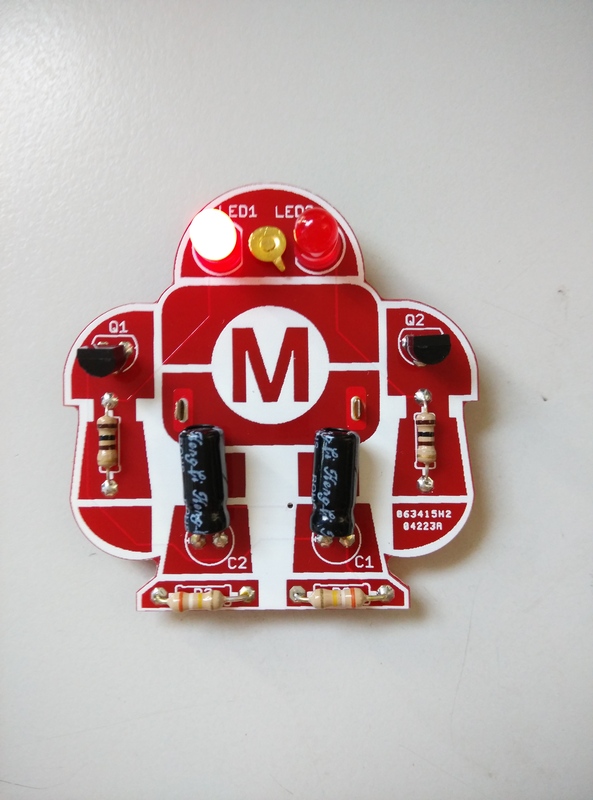 The circuit is a astable multivibrator that controls the “eye” of robot. 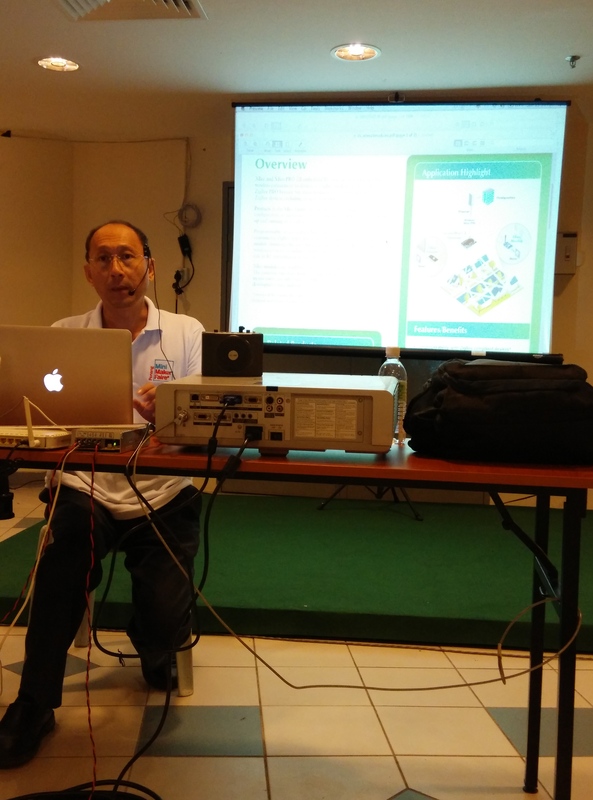 Besides attending the 3D printing and design workshop, I have also attended the Arduino + Zigbee workshop by SD Liew. 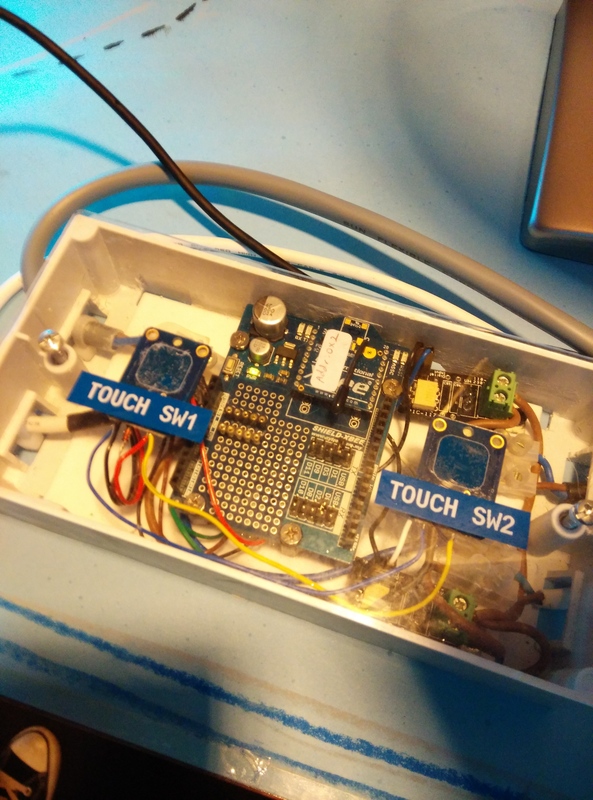 This workshop explained the basics of using Zigbee with XCTU. Hopefully the information gained from this workshop is useful in my future project. 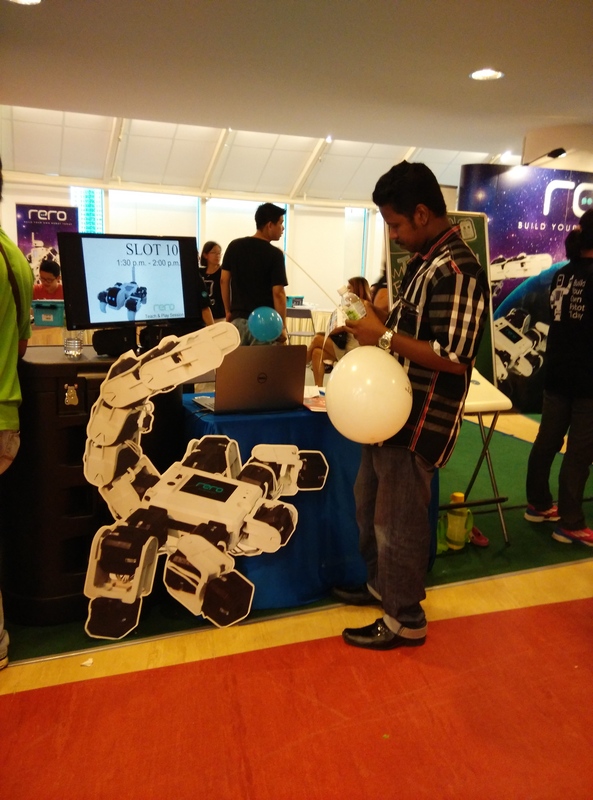 It was my first time to see Rero in action during the Penang International Science Fair. 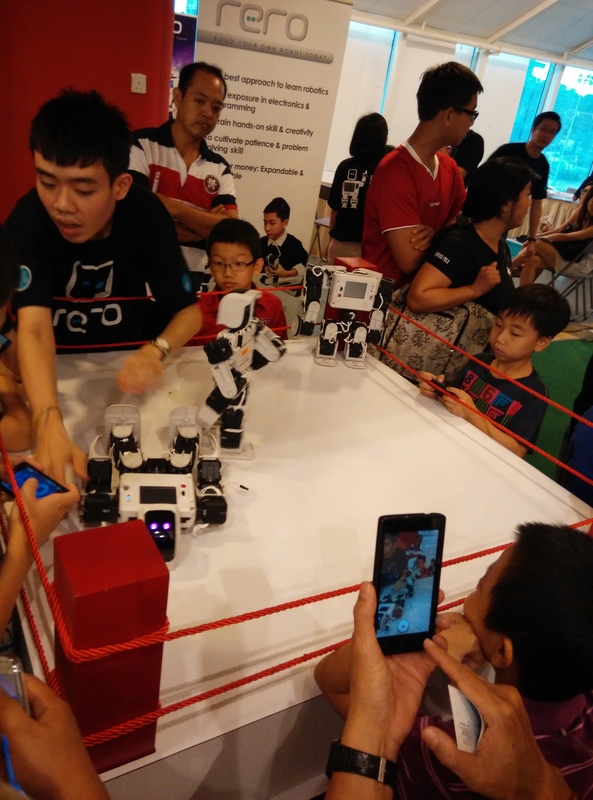 For your information, Rero is a reconfigurable robot, allowing kids to expose themselves to robotics in earlier age. This is a product designed and made in Malaysia. 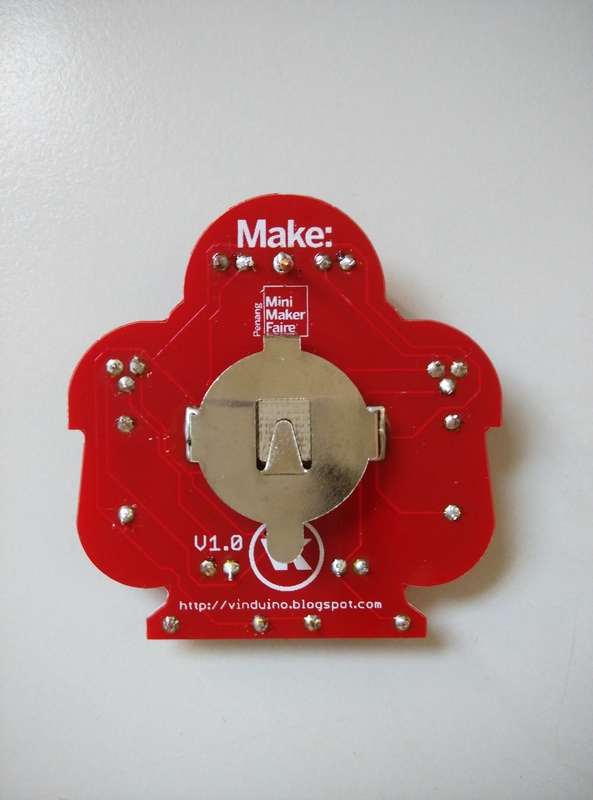 Overall, I think this is an eye opening experience to me as this was my first time attending a Mini Maker Faire. 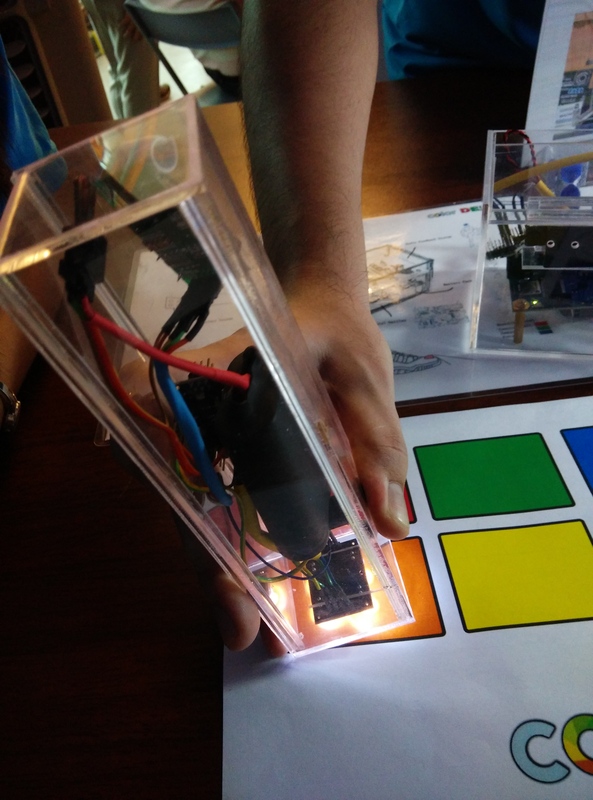 Hopefully, we will see more similar events happening all around Malaysia with the growing number of makers among the community.